I promised a series on flat bread. Up next: flour tortillas. In my lived-in-Texas-for-9-years opinion, commercially-made flour tortillas are kind of terrible. The warm handmade flour tortillas that you find at good Tex-Mex restaurants and certain breakfast taco joints in Houston have probably spoiled me forever. Luckily, it isn't too much work to make awesome, soft, tender Tex-Mex style flour tortillas at home. Although they don't keep as long as commercial flour tortillas, too many tortillas has never been a problem in this house. This is how we do it. These aren't strictly authentic Mexican flour tortillas, since they contain leavening. If you like Texas style tortillas (puffy, chewy, and tender), though, you are in the right place. Our friend Drew shared his basic tortilla recipe with us last year, and we've been playing around with it ever since. Our main tweaks: making the dough in the stand mixer and swapping freshly rendered lard for vegetable shortening. These are awesome tortillas. If you like white whole wheat flour, we've also had some success swapping 1/4 of the AP flour for white whole wheat. You need to add a few extra tablespoons of water to prevent the tortillas from drying out, but both the texture and flavor are great. 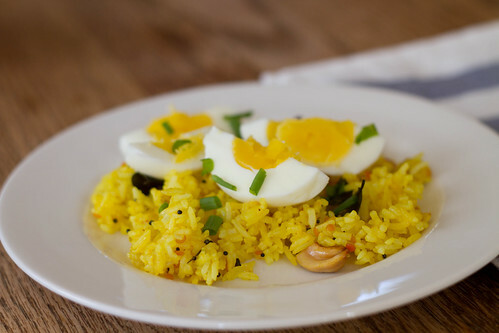 One last thing: we make these on a fairly regular basis, even on weeknights. It takes some time, yes, but the final product is so worth it. Eat 'em while they're hot. 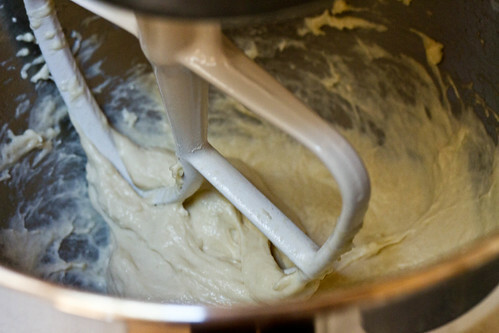 Stand mixer: Combine the flour, salt and baking powder in the mixing bowl. Add the fat and use the mixing attachment to work it in until you have a coarse meal. Add warm water and mix until the dough comes together in a ball, 5 minutes or so. 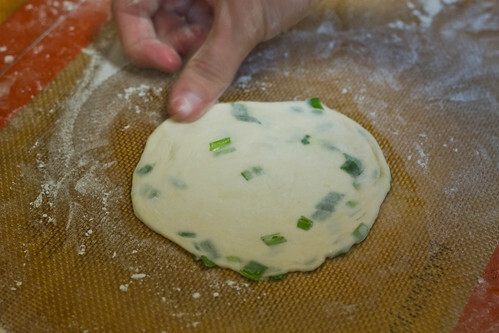 If you touch the dough with your finger, you want the dough to dimple lightly under the pressure. It should be smooth, moist and slightly sticky. If your dough is at all dry, add warm water a tablespoon at a time and mix in. Dump out the dough onto a floured surface, form into a ball, cover with plastic wrap, and let the dough rest 10-20 minutes. 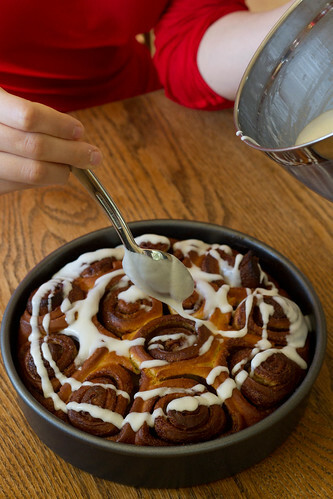 By hand: Combine the flour, salt and baking powder in a mixing bowl. 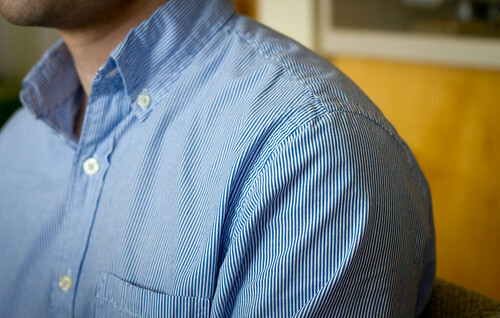 Work in the fat with your fingers until you have a coarse meal. Add warm water and stir it until the dough comes together. If your dough seems dry, you can add a little more warm water, a tablespoon at a time. (Adding more water will help them stay softer for longer, but will also make them a bit trickier to roll out.) Turn the dough out onto a well-floured surface and knead until smooth, 2-5 minutes. If you touch the dough with your finger, you want the dough to dimple lightly under the pressure; it should be smooth and just a little sticky. Form the dough into a ball, cover with a clean towel or plastic wrap, and let the dough rest 10-20 minutes. 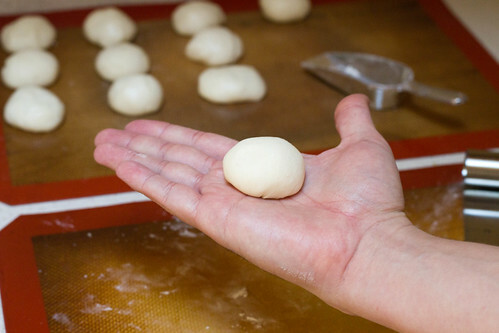 Now, on a well-floured surface, divide your dough into 12-18 equal-sized balls. We roll out 16 balls of dough. Now, if you like, coat the balls of dough in a scant amount of extra lard/shortening. 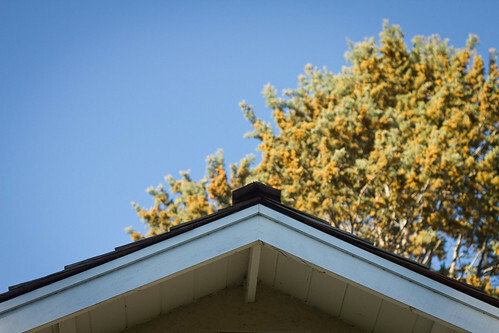 This step prevents them from drying out but it's not necessary if you work quickly. 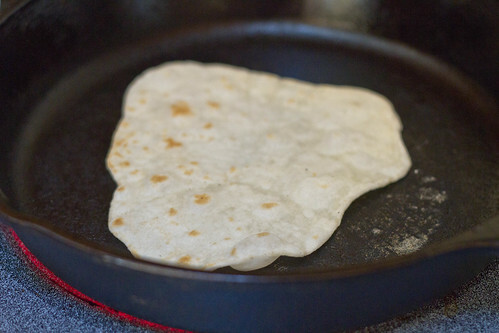 Now you are ready to cook your first tortilla. Prepare a couple of clean dish towels in which to nestle your cooked tortillas. Now, set the first tortilla in your hot, dry skillet. 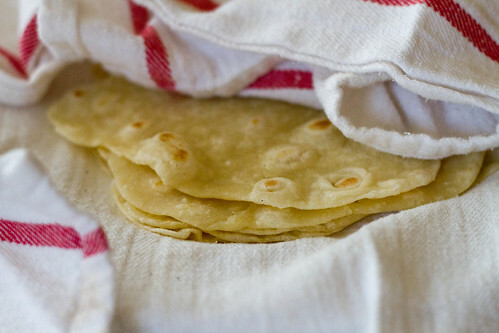 The tortillas will start to puff and develop light flecks of brown when they are ready to be flipped. Aim for ~30 seconds per side; you want them to cook quickly and retain moisture. When they come off the skillet, immediately nestle/stack them in the dish towels to keep them warm. The tortillas will continue to steam a bit in the dish towels, which helps keep them warm and soft. Repeat this process with the remaining balls of dough. (By the way, it is nice, but not mandatory, to have two people for this job: one to roll out the tortillas, and the other to manage the cooking.) Cooked tortillas will keep for a day or two in a plastic bag. Reheat in a skillet or microwave. What to eat with your tortillas? 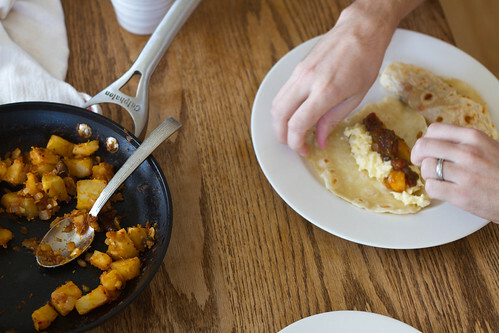 Eggs scrambled with grated cheese; eggs with fried chorizo; spicy potatoes; black beans. This is how Kim makes them: Preheat oven to 250 degrees. In a large, oven-safe, lidded pot, combine one pound of dry black beans, half a chopped onion, a heaping spoonful of lard, 1/2 tablespoon salt, and a sprig of epazote if you can find it. Add enough water to cover it by an inch and a half and bring it to a boil on the top of the stove. When boiling, cover with a tight fitting lid and bake in the oven for at least 75 minutes, or until tender and creamy. 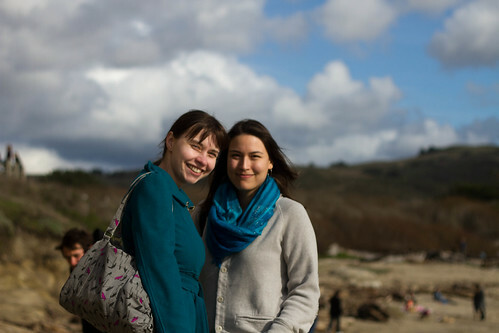 I had a special guest in town this past weekend: my good friend Ula who flew down from Portland to hang out. This girl is great; I'm happy to call her a friend a full 14 years (!) after meeting in Mrs. Webb's advanced English class. I love meeting new people but there's just something so satisfying about friendships that have endured since those silly, strange, and wonderful days of high school. 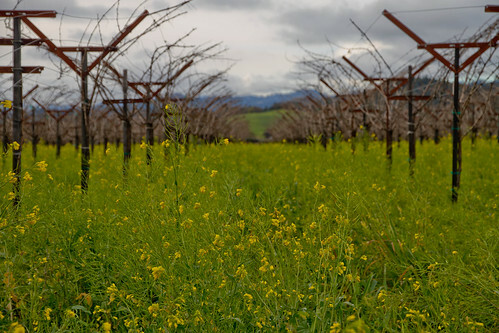 We spent 3 days adventuring, eating and drinking our way around the Bay Area. When we weren't exploring, we cooked, drank boozy hot chocolate and kind of an amazing amount of wine, and wondered where the hours went. 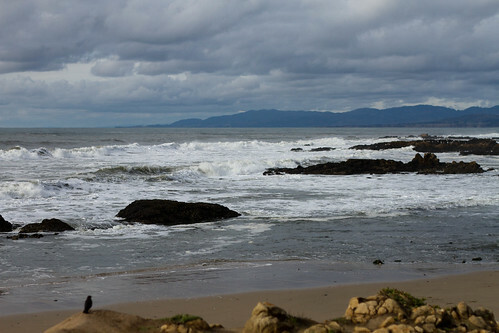 And, despite being a cold, gloomy and rainy weekend, Northern California somehow managed to be photogenic anyway. I'm back, after a much needed break. First I'm posting these pictures because of the colors. They make me happy; I think I'm finding the combination of blue and yellow so compelling right now because of all the gloomy rain in the Bay Area this weekend. + Checking out apartments in Paris for this summer; fingers crossed, we may have found one that is available for the 3 months we need. + Looking at heart-wrenching pictures from Tahrir Square, Pearl Square, Tunisia, Libya -- the pictures on the NYT Lens blog are amazing. + Enjoying funny/cool/interesting Internet things, like this article on the BBC shipping forecast, this short anti-Amy March screed (seriously, Amy March is one of the most loathsome little sisters in young adult literature), and this visual breakdown of all the samples used in Girl Talk All Day, my go-to workout album. + Speaking of YA literature, re-reading Anne of Green Gables, which I love as much as ever and the scenes where Matthew dies (gulp) is so, so sad (I'm fine, there's just something in my eye). + Listening to 80's synthpop. Also, for no reason at all, Fantasy on repeat -- can't stop, won't stop, and whoever produced that song and used the addictive Genius of Love sample, I salute you, because it absolutely holds up 15 years later. Kick it, Mariah. + Holding off an ant invasion in the kitchen and bathroom. The answer is boric acid. + Using the oven extensively because it is cold; roasting cauliflower with cumin seeds, baking this banana bread from the always-brilliant Melissa Clark and braising beef with melted onions and Hungarian paprika. 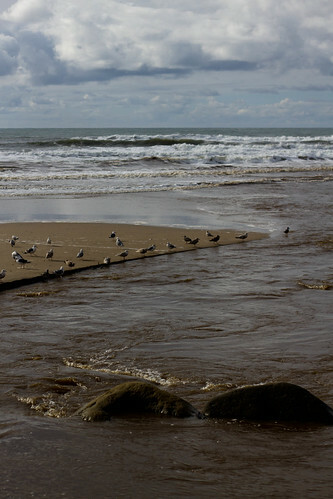 + And obsessively looking at pictures like these, because I'm both yearning for summer and vowing to tackle film again. If you're like me, you think Valentine's day is a bit silly and commercialized. And yet, you can feel free to call us hypocrites, because Mark and I always do something for Valentine's day anyway. I find it is a very good excuse to cook something special, to drink champagne with dinner, and to eat a dessert with as much cream as possible. No flowers (ok, I do like flowers but lately I'm more into houseplants) and no chocolates (though a wheel of Cowgirl Red Hawk would never be an unwelcome gift) required, though. On our first Valentine's day together, Mark set the standard for all future Valentine's days by cooking me dinner at his apartment. I still remember that night perfectly, because I was a wide-eyed college sophomore who had never had a boy go to so much trouble -- making Hollandaise sauce and vanilla bean crème brûlée from scratch! -- just for me. I was so impressed. The dinner wasn't without mishaps, though; Mark's attempt to cook the sugared tops of the crème brûlée using the broiler and a bit of rum was a failure, and he eventually just scraped off the rum-soaked, burned tops so we could eat the underlying custard. He was embarrassed, but I thought the whole night was just perfect anyway. And ever since, I've insisted on low-key Valentine's dinners at home. This year, the honor and responsibility of preparing our dinner falls on me. I thought I would keep the dinner part fairly simple -- mussels steamed with fennel, white wine, herbs and cream, with crispy frites and an arugula/pear/goat cheese salad on the side. 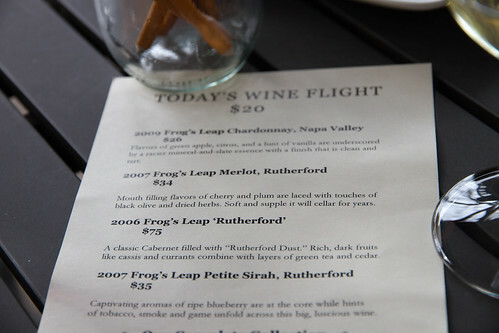 (I don't mind doing advance prep work, but I like to plan a menu that won't involve a lot of after-dinner cleaning.) And for dessert? Let me bold it, just to properly demonstrate how excited I was to make this: dark chocolate mousse, spiked with single malt whisky for my whisky-loving husband, and heaped with the heaping-est heap of whipped cream there ever was. I was hoping to have a recipe to share with you today, but it is with some regret that I report the recipe I used didn't work for me at all. Something happened between melting the chocolate and folding in whipped egg whites, and my chocolate (which started out so silky and glossy!) seized. The final mousse is soft, creamy ... and riddled with little chunks of seized chocolate. However, the good news is that it is downright impossible to make the combination of good bittersweet chocolate, farm fresh eggs and whipped cream, sugar, espresso, and single malt whisky taste bad. It actually tastes quite wonderful, if you can ignore the texture (and I believe we can). Then, it occurred to me that my chocolate mousse mishap is rather similar to Mark's crème brûlée mishap, so let's toast: whether your creme brulee is lacking a crackled top, or your chocolate mousse is lumpy, here is to eating dessert with someone who doesn't care one bit. Has anyone else noticed that this blog is 99.99% "she cooks" and 0.01% "he bakes"? It has been awhile since I've posted anything, and I think it's about time I start pulling my weight on this blog. That said, I haven't baked anything new lately. 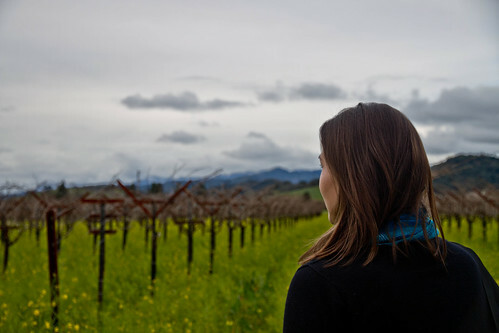 So what to blog about? Well, my latest obsession is flat bread, the kind that you heat on the stove rather than the oven. Eventually we'll talk flour tortillas, but today I'm starting with one of my favorites in honor of the newly begun year of the rabbit. 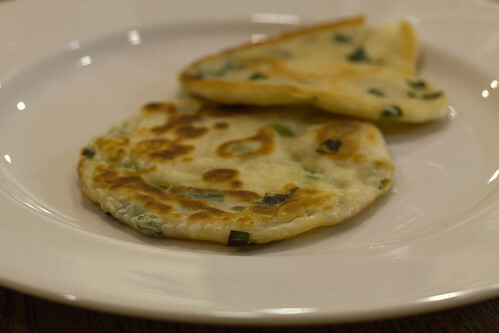 Scallion pancakes are quite possibly China's greatest gift to humanity. I know what you're thinking... what about gunpowder, the compass, paper, the fork, negative numbers, kites, and Mahjong? Well, fry up a few of these and then tell me what you think. 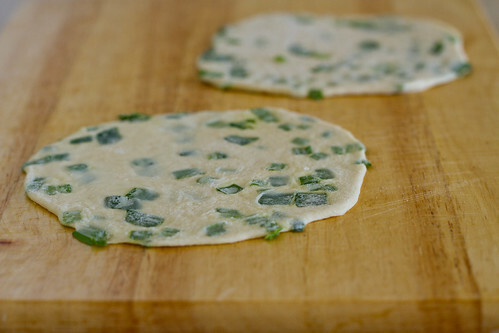 Scallion pancakes are chewy, tender, flaky and so insanely delicious that you don't mind burning your fingertips to eat them while they're hot. I like to dip them in a mixture of soy sauce and garlic/chile oil (heat some peanut oil in a wok, add some roughly chopped garlic, cook on low until garlic is fragrant and translucent, add crushed red chile flakes, done). These are a good late-night snack or as a first course for a Chinese dinner. Scrape the dough into an oiled bowl and cover. Let the dough rise for 30-45 minutes. 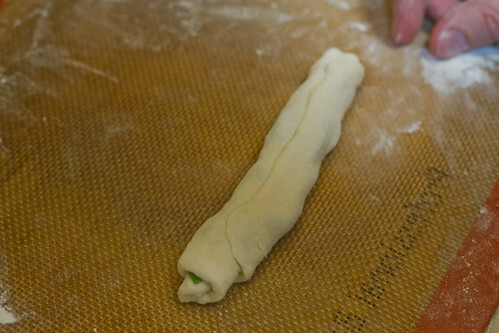 Then turn the dough out onto a well-floured surface and roll into a log. 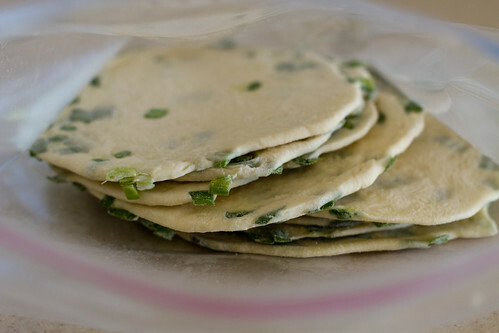 Divide the dough into approximately 20 ping-pong ball sized pieces. 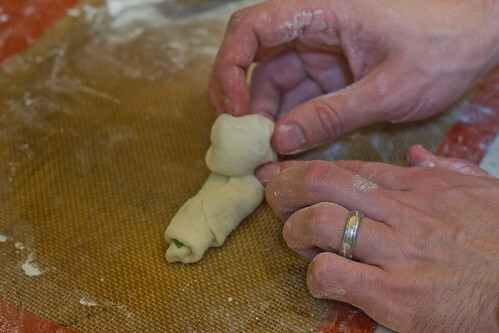 One at a time, using a well-floured rolling pin, roll each ball into a thin disk. Brush the surface with a scant amount oil (peanut works great; some people like sesame but I think the flavor is too strong) and sprinkle on a small handful of chopped scallions or garlic chives -- just enough to lightly cover the surface. Roll up the disc into a tight cylinder, and then coil up the cylinder. 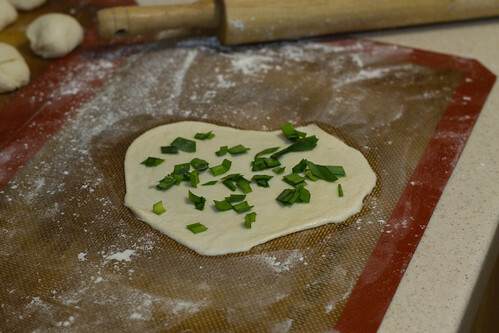 Repeat this for each piece of dough. 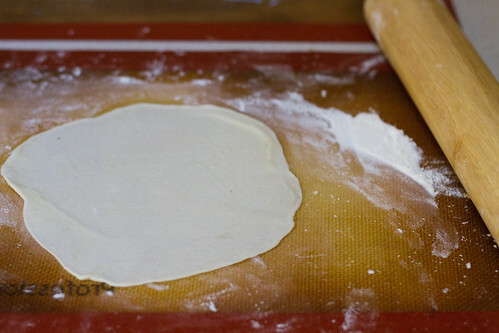 Next, using your floured rolling pin, flatten each coil into a pancake. Ours end up approximately 5 inches in diameter. To cook the pancakes, heat up a wide nonstick frying pan over medium high heat. Add an ample amount of oil (at least 1 tablespoon); once heated, add as many pancakes as will fit in the pan. Cook until golden brown and flip to cook the other side. Generally, it takes ours between 2-3 minutes per side, but the timing will depend on how hot your pan is. Continue cooking as many as you like, replenishing the oil as necessary. Any remaining uncooked pancakes can be set on a cookie sheet and individually frozen, though I have to warn you that they don't get as quite puffy/flaky after being frozen. Defrost a few minutes and fry. They make an excellent late-night snack. 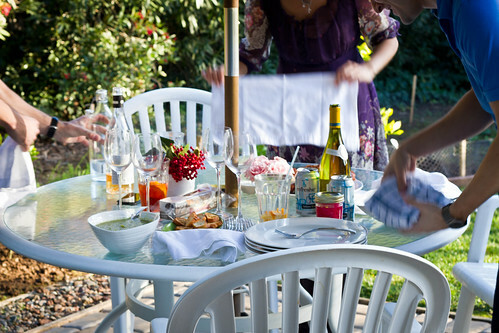 A few weekends ago, I planned a lunch party for one of my favorite travel companions and longtime friends Grace. She brought her friend Christian, flowers, wine, and this astonishingly good sparkling jasmine tea. We made a salad and grilled a whole chicken Mexican-style, which we ate with various things -- raw tomatillo salsa, wilted chard, hot pink pickled onions, and corn tortillas. Smoke from the grill wafted through the air, our skin felt hot from the sun, and we lingered at the table and talked for 4 hours. I could have stayed out there forever. Eventually the sun set, though, and we retreated inside for warming glasses of Fernet, dessert and more catching up. Sunday afternoons aren't always as lovely as this, so I want to remember it. This picture helps. I like planning menus but I always waffle (big time) about what to make. In the end, though, the warm weather made my decision for me; how could you even think about braising lamb when it is 70 degrees and sunny outside? Nope, salad and smoky grilled chicken in the sunshine sounded just right. And once I saw the arugula and mounds (I'm talking mounds) of citrus and avocado at the market, I knew just what kind of salad to make. My favorite kind of salad is the kind that is full of contrast. Take the classic French combination of endive, greens, pear, Roquefort and toasted walnuts. In one bowl, you've got bitter and crunchy (endive), juicy and sweet and crisp (pear), pungent and creamy (blue cheese), warm and crunchy (toasted walnuts), cold (everything else). By playing around with different flavors and textures, you can come up with an almost unlimited number of ways to make your salads contrast-y and interesting. When I'm making salad, I like to include at least 2 or 3 contrasting elements to keep things interesting. 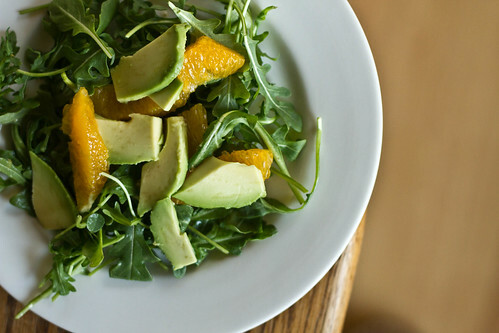 In this arugula salad, you get crisp texture and peppery flavor from the arugula, sweetness and juiciness from the orange, and a firm creaminess from the avocado. The vinaigrette (not too much!) adds some additional richness, sweetness, tang, salt and some heat to the party. Also, if you make and eat while the chill of the fridge is still on all the ingredients, everything should stay cool. The only thing missing is some crunch (doh! slivered red onions were in the refrigerator waiting to be added). Slivered red onion, dunked in an ice water bath to tame the pungency, or sliced radishes would work well here. Go forth, and make salads everyone! Here is mine. A few notes about the ingredients: Freshly squeezed navel orange juice turns bitter after 20 minutes or so (weird, right?). If you use navels, you'll want to juice the oranges just before serving. 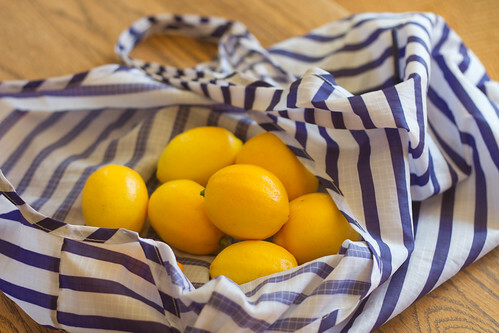 If you use a different variety of citrus, you can make and refrigerate the vinaigrette a few hours in advance. 1. Wash and dry your arugula carefully and heap in a salad bowl. 2. Segment the oranges by slicing off the ends with a sharp knife. Cut off the peel and white pith, then segment the orange by slicing between the membranes. Drop the segments into a bowl and squeeze any remaining juice into the bowl with the segments. Reserve the juice. 3. Combine the olive oil, lemon juice, oregano, salt, cayenne pepper, honey and reserved orange juice. Mix well, taste and adjust seasoning (I like it to start sweet and end with a hit of spice at the back of your throat). Set aside. 4. 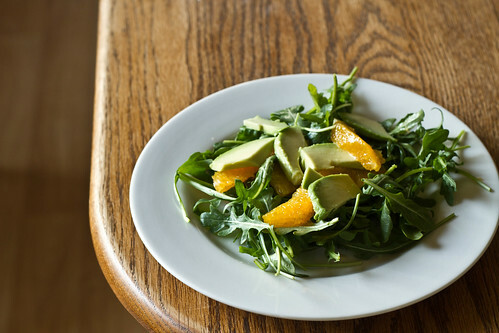 Just before serving, add the orange sections to the salad bowl containing the arugula. Top with thin slices of avocado. Mix the dressing once last time and gradually add to the salad, folding the mixture as you go, until each leaf is lightly dressed with the vinaigrette. You may not need all the vinaigrette; any leftover vinaigrette will keep in the fridge for several days. I had big plans for this weekend. And yet the most exciting thing that happened was a traumatizing meeting between my ring finger and our biggest knife. Otherwise, I felt under the weather, Mark worked, and I spent Saturday night with my laptop and the Great Romantic Movie of Our Time, aka Twilight: Eclipse, during which I groaned so loudly and laughed so often that Mark came in to check on me. Also, for the first time in maybe a month, we woke up to cold rain on Sunday. Boo that. One thing that makes cold, rainy weekend mornings bearable, though? Breakfast. 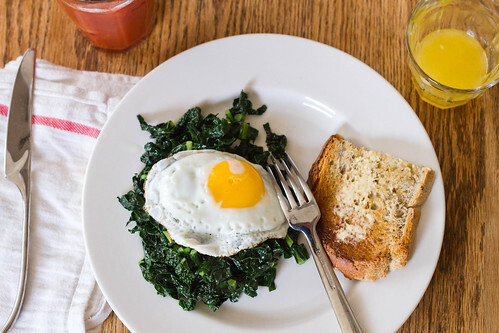 Weekend breakfasts at home are the best! I understand why most people love going out for brunch -- sometimes you want waffles but don't feel like digging out the waffle iron and dirtying any bowls, right? 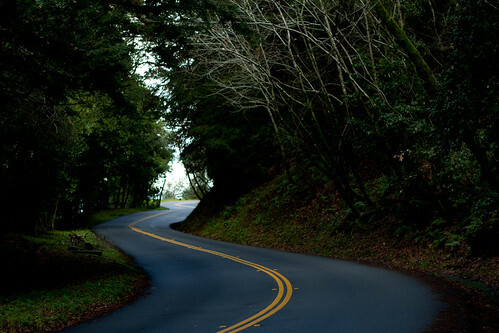 But I like those quiet moments in the early morning, sipping coffee while contemplating the best way to start the day. Besides, I'm married to someone who has sworn off going out for brunch. (Dim sum excluded, though even then I force myself to eat something beforehand or I'm apt to cause a scene at the cheong fun cart.) The last time we went out for brunch -- 2009, Washington, D.C. -- was possibly The Last Time we went out for brunch Ever, and it is all because the waiter left Mark coffee-less for more than 30 minutes. However, there is one brunch tradition that Mark the self-avowed brunch hater has adapted: cocktails. He hates tomato juice but will drink it happily once it is doctored with all sorts of spices and spiked with alcohol. Enter his recent favorite, the Nordic Snapper, a recipe from Jason Wilson's book Boozehound: On the trail of the rare, the obscure and the overrated in spirits. No surprise that my vodka-eschewing/aquavit-loving husband went wild eyed after one sip; using aquavit (essentially vodka infused with herbs, primarily caraway) instead of plain vodka makes for a seriously complex, savory drink. I love the flavor of caraway, but a little aquavit goes a long way for me -- I actually prefer doubling the tomato juice, leaving out the alcohol and drinking my spicy, tangy, salty tomato juice with a side of good rye toast and some smoked salmon. Our differences, they make the world go round. P.S. My candy thermometer exploded on me recently, recommendations for a replacement? An aside on the name: management at the St. Regis hotel thought the name Bloody Mary was inappropriate and rechristened it with a more "civilized" name, the Red Snapper. The Nordic snapper replaces vodka with Danish akvavit, the caraway infused spirit from Scandinavia, and eschews the celery stalk for a few dash of celery bitters. About brands, you should use whatever you like, but if you need any recommendations Mark likes Aalborg aquavit, Knudsen's tomato juice, and the celery bitters made by The Bitter Truth for this drink. 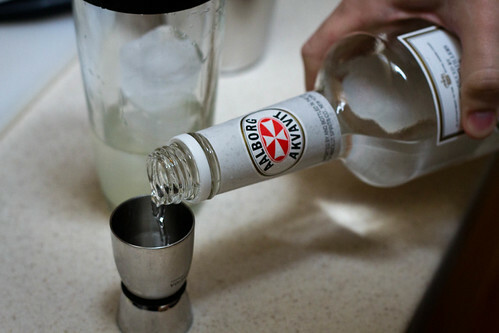 Fill a cocktail shaker halfway with ice and add all of the ingredients except the lemon peel. 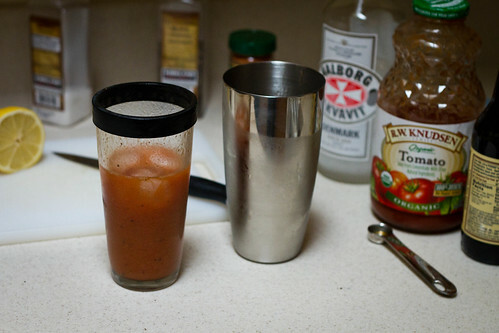 Shake well, then taste and add additional salt if necessary; a low-salt tomato juice like Knudsen's may require additional salt. Strain into a highball glass filled with ice. Garnish with a lemon peel. 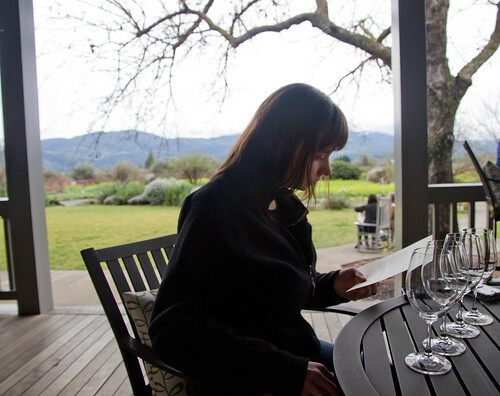 what we do: we dedicate this blog to logging our culinary pursuits, travel and fun. we are prolific home cooks (mostly her) and bakers (mostly him). she: loves feeding family and friends, traveling, photography, and when people take seconds. favorite things to make: roasted anything, stocks and soups, braises. he: engineer/mathematician. likes Rice baseball, kneading dough and mixing drinks. most used tools are stand mixer, electric drill and Matlab. favorite things to make: pain a l'ancienne, pizza Napoletana-style, cinnamon brioche, sour cherry pie, anything fried in duck fat.